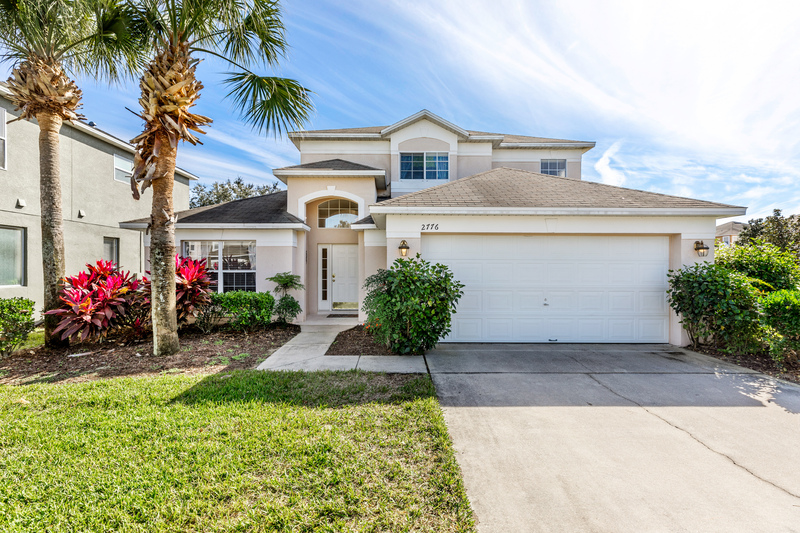 Our home is situated on one of the largest corner lots in Emerald Island Resort in sunny Florida. At the side of the house is land measuring 55' X 150' - Great for some outdoor games. 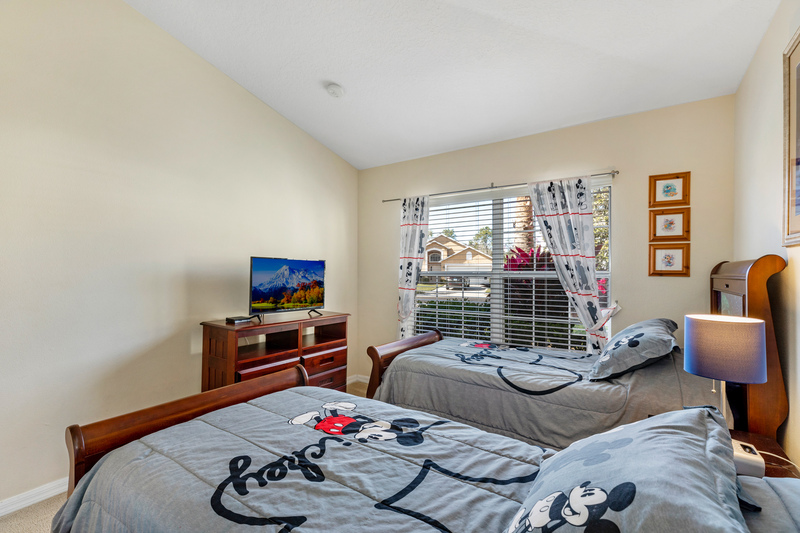 The huge Master bedroom and Disney twin bedroom are on the ground floor, with the Queen bedroom and two further twin bedrooms on the second level, which really does help those kids stay sleeping while you are enjoying some of the activities on offer at the villa! 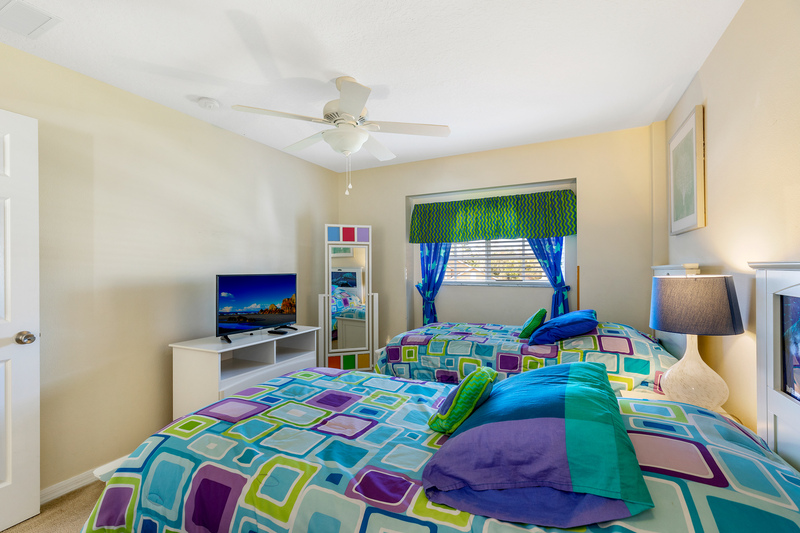 All areas of the villa are fully air conditioned to keep you cool even on the hottest days! 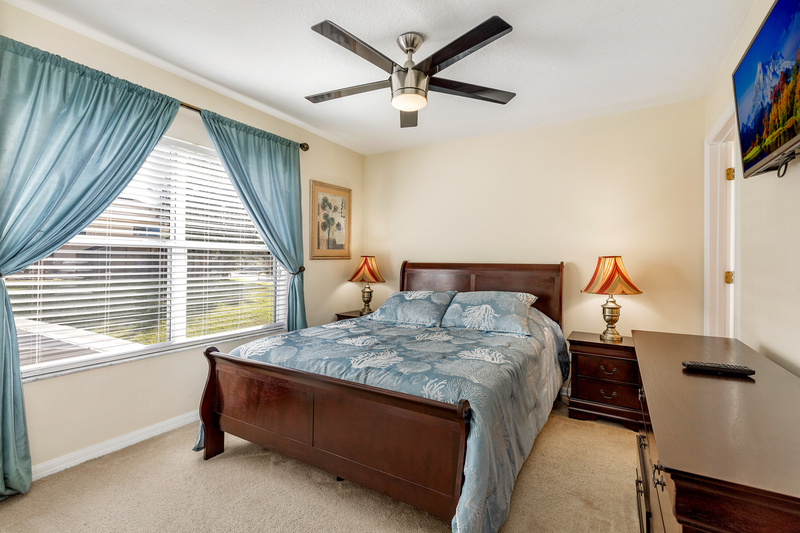 As you enter this beautiful villa, you will love the spacious feeling and the vaulted ceilings with ceiling fan. The lounge area is a great place to recover from the parks! 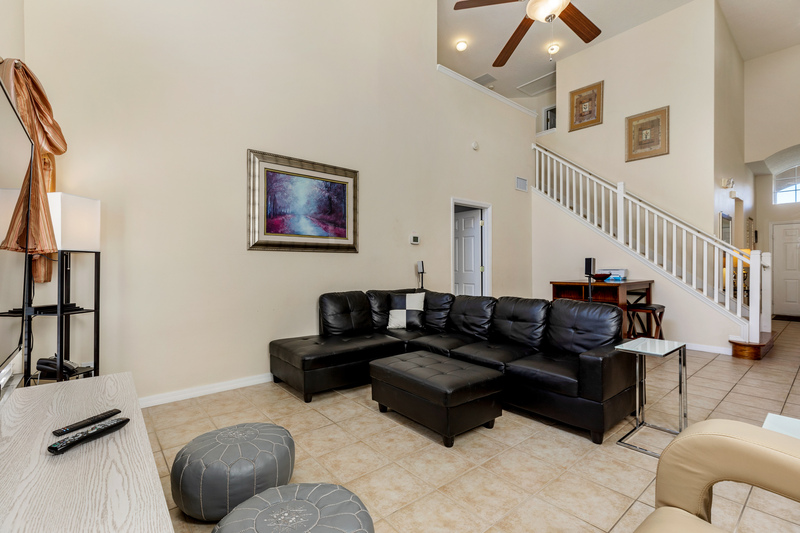 There is ample seating for two families to enjoy the 70" Smart television with surround sound. (Remember to bring your Netflix code!) and a Blu Ray DVD player together with supplied movie,and a soundbar with wifi connection should you wish to listen to your own music. 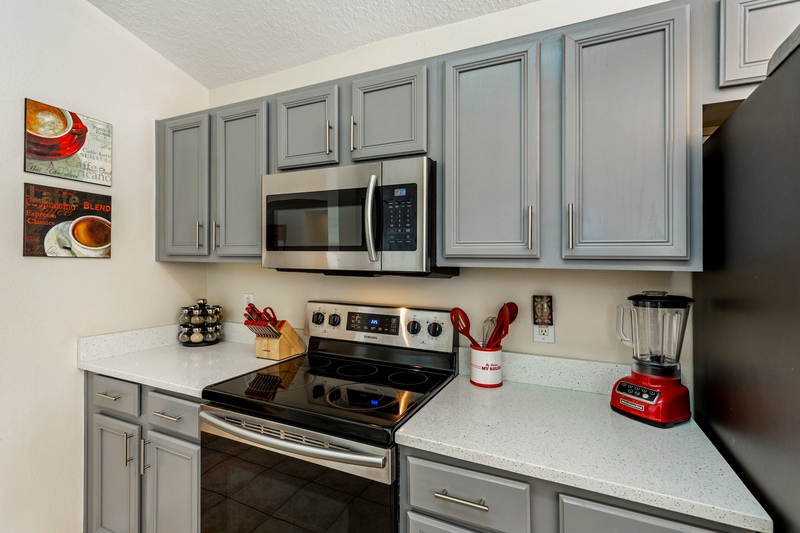 There is a well specified kitchen area which contains a cooker, fridge freezer, microwave, dishwasher, coffee machine and just about every essential item you may need. 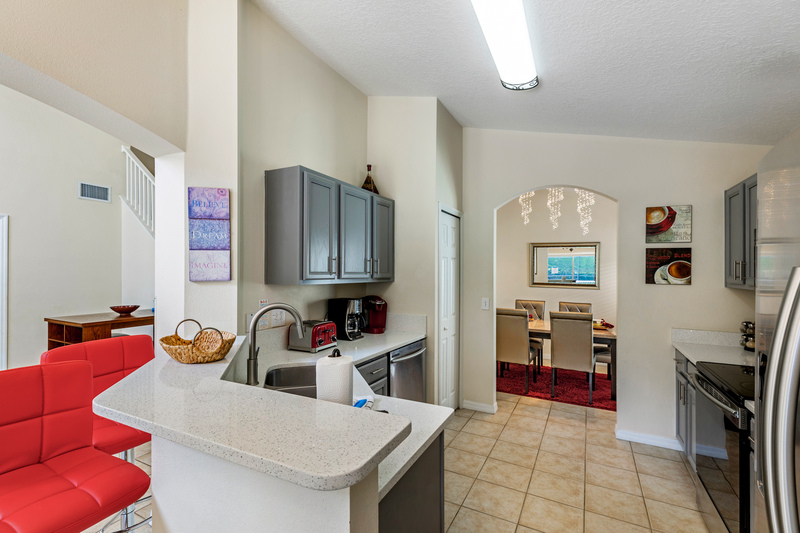 The kitchen leads into the informal dining area. This has an Italian style table with four chairs. 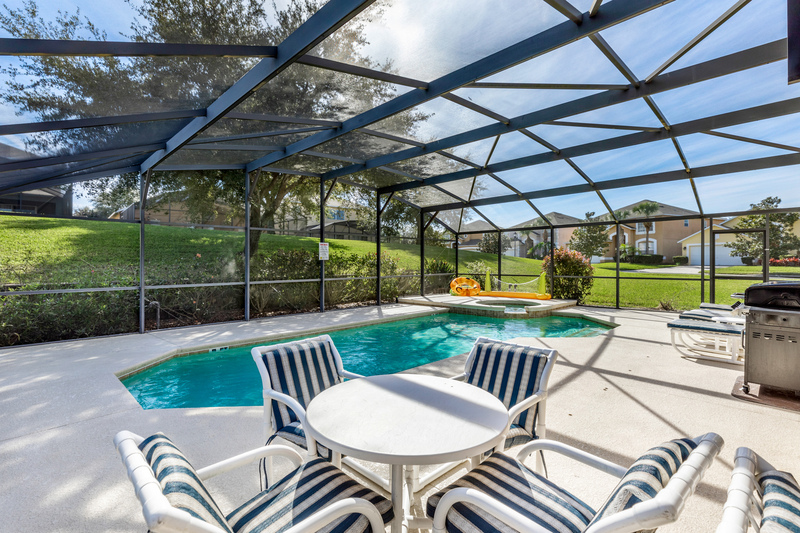 There are patio doors which lead to the oversized pool deck, and large pool with underwater lighting and in-ground spa. There are two patio tables with four chairs on each one. Four relaxing sunbeds are provided for your tanning pleasure. The deck is south facing so there's no need to keep moving those sunbeds around chasing the sun! 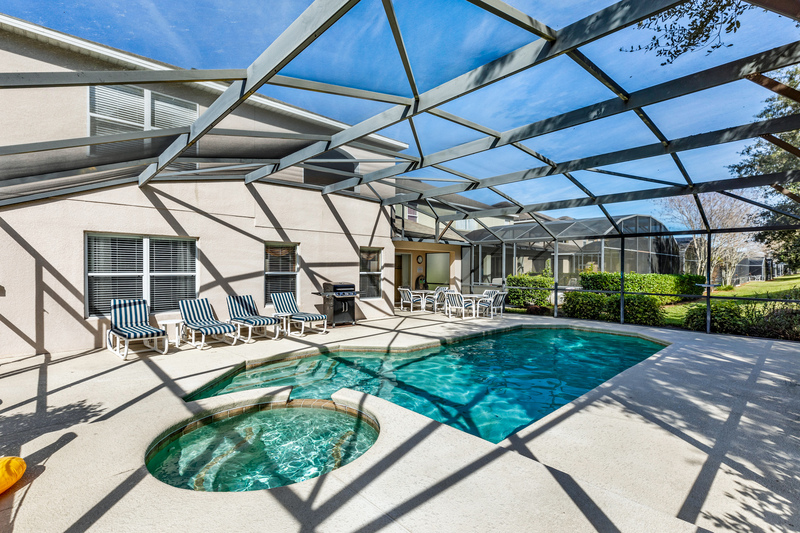 There is also a covered lanai with ceiling fan to provide shade if the Florida sunshine becomes too much. We even have a lemon tree should you wish to pick the odd one for your evening drinks!! 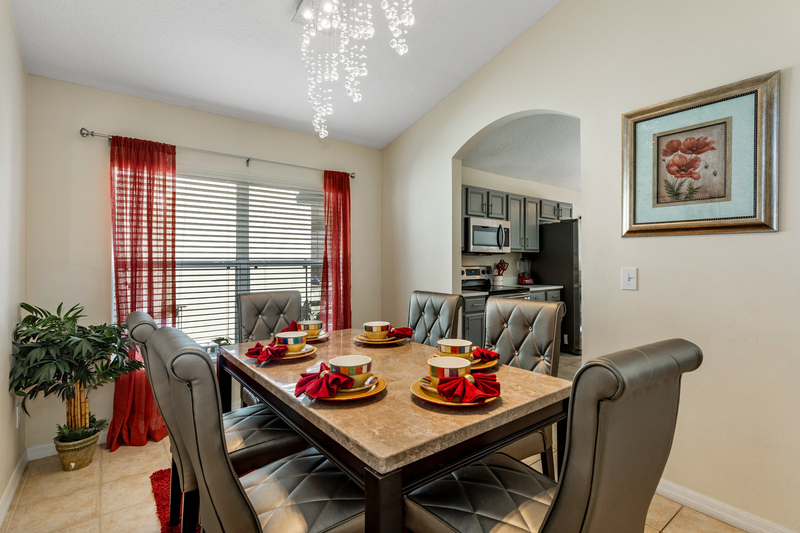 In the formal dining area is a beautiful Italian style dining table and six chairs. The master king bedroom on the ground floor is huge! 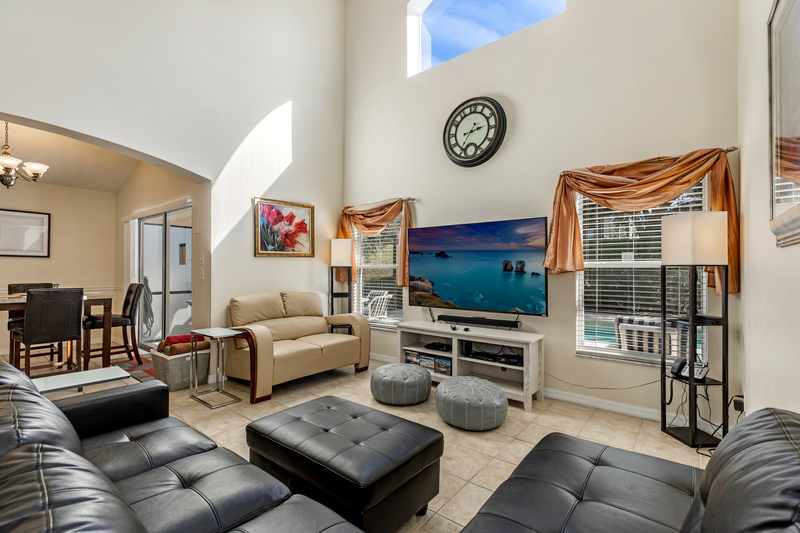 It has a 20' flat screen and beautiful furniture and we have installed a luxury iJoy massaging chair for our guests to enjoy. 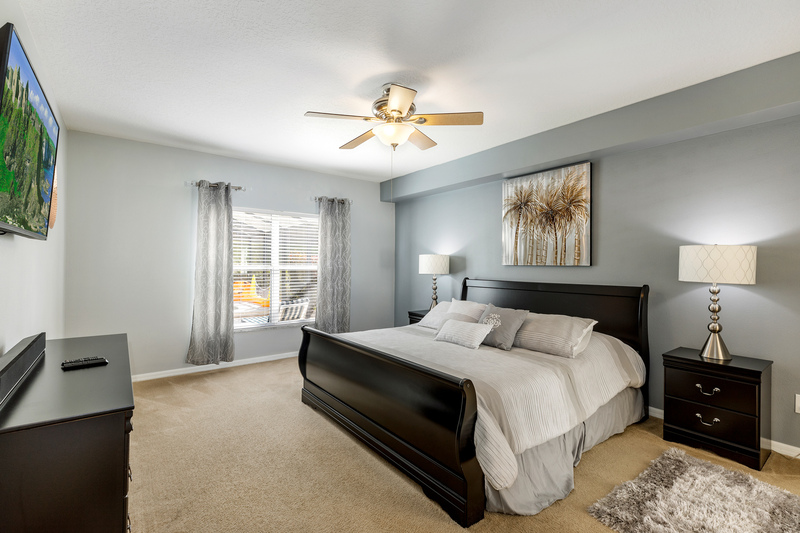 There is a ceiling fan for that gentle breeze. 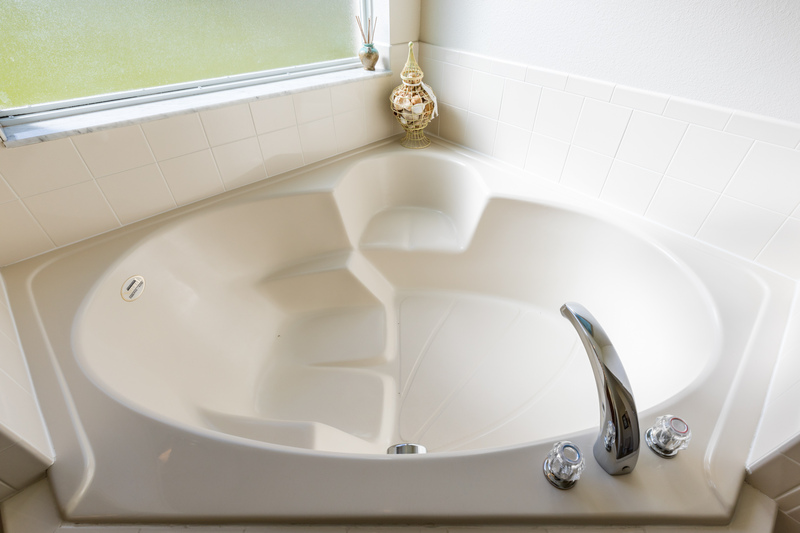 There is a large en-suite which has double marble sinks with vanity unit and a large corner bath tub. 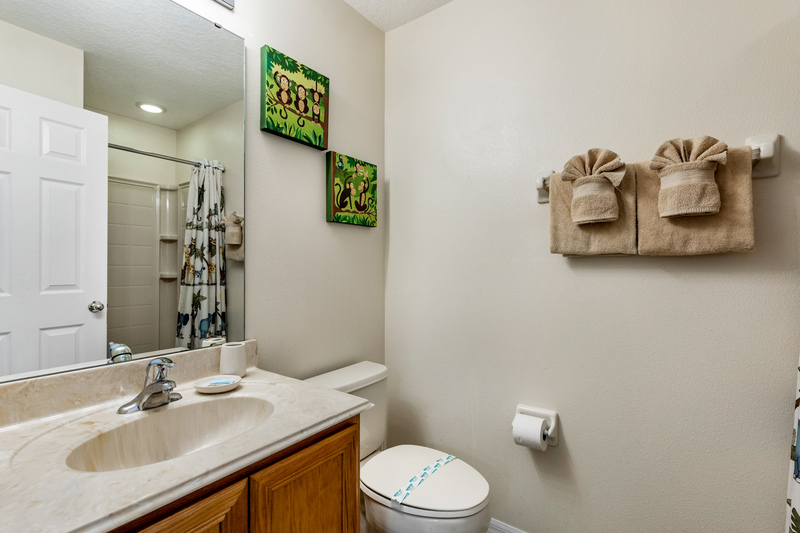 There is an enclosed shower and toilet. There is also a supplied hair dryer and shaving mirror. There is also a large walk in wardrobe with lots of hanging space and shelves, and a safe for your personal items. 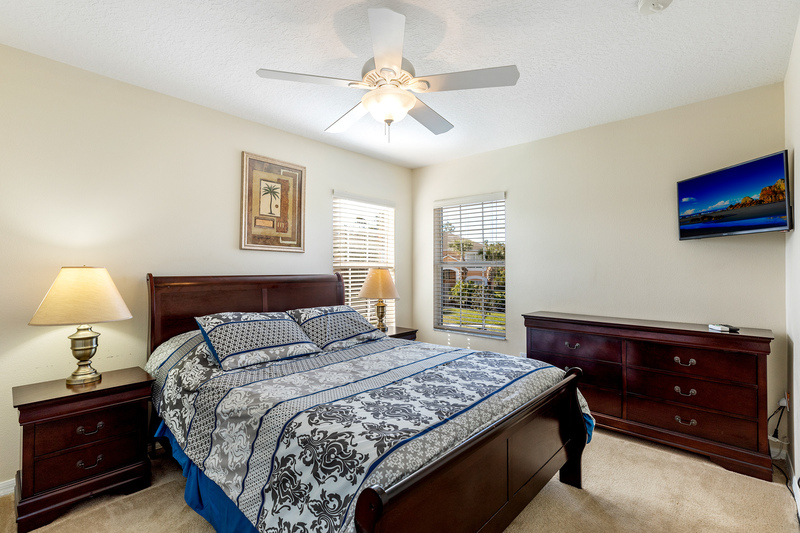 The second master queen bedroom is located on the second level and has a large fitted wardrobe. 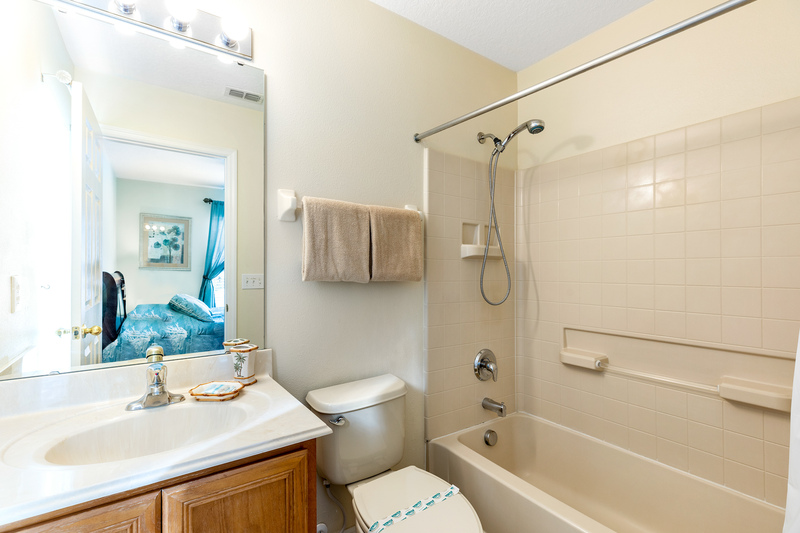 Connected to this room is an en-suite bathroom with a marble sink with a vanity unit, full bath, shower and toilet. 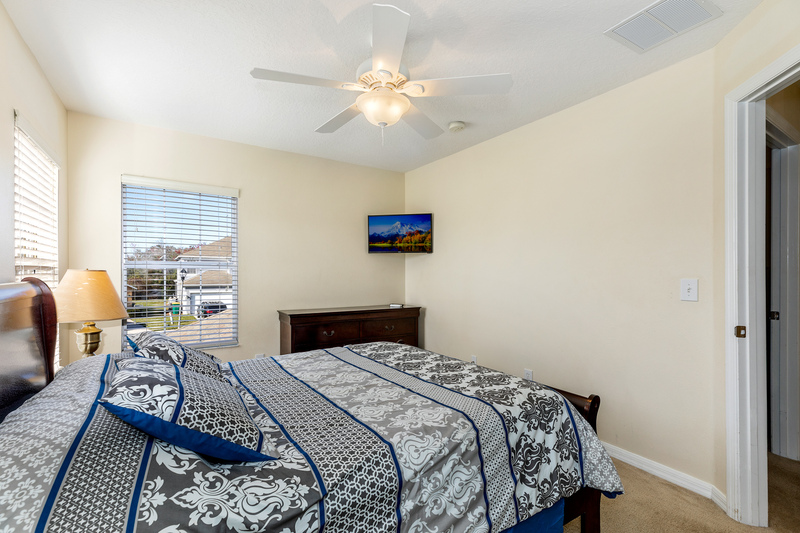 There is a 22" flat screen tv and dvd player in this bedroom for your enjoyment. 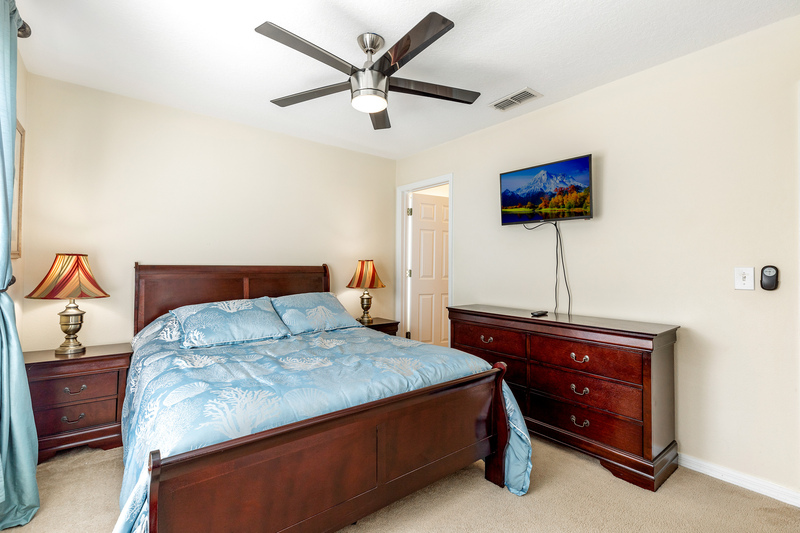 All bedrooms have televisions with cable TV. 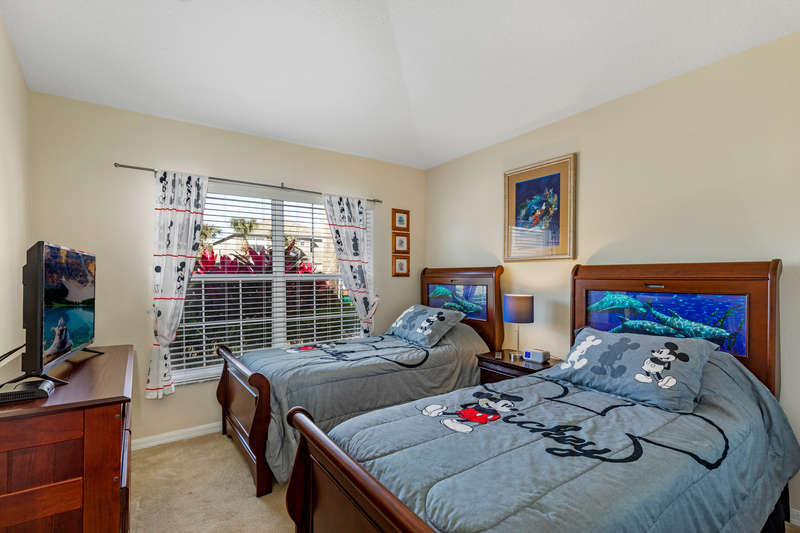 One of the twin rooms (Disney Room) lies on the ground floor with the remainder on the second level. Beautiful soft furnishings give these rooms an immediate feeling of peace and tranquillity. The two twin bedrooms on the first floor are furnished to a high specification, one being a funky 'teen' bedroom the other a relaxing and sophisticated room with European style duvets and elegant colour scheme. All rooms have built in wardrobes. 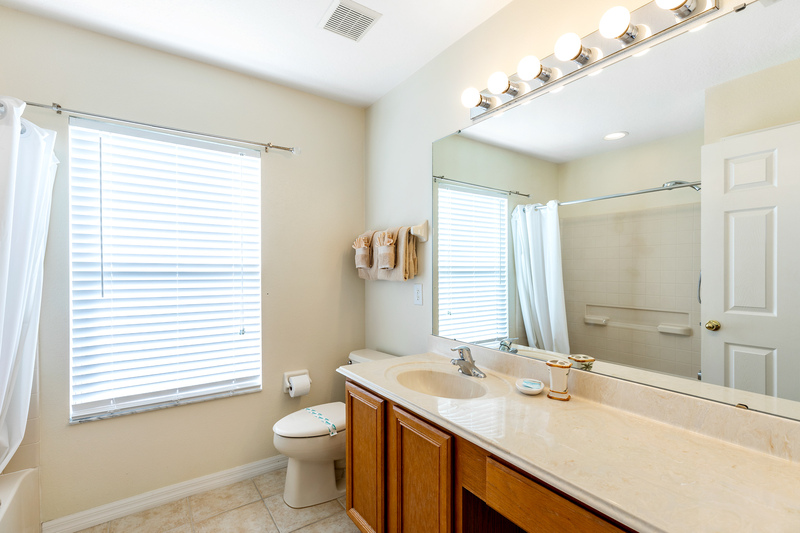 Two of these rooms share the family bathroom and one has the use of the ground floor shower room with marble sink with a vanity unit, toilet and shower. 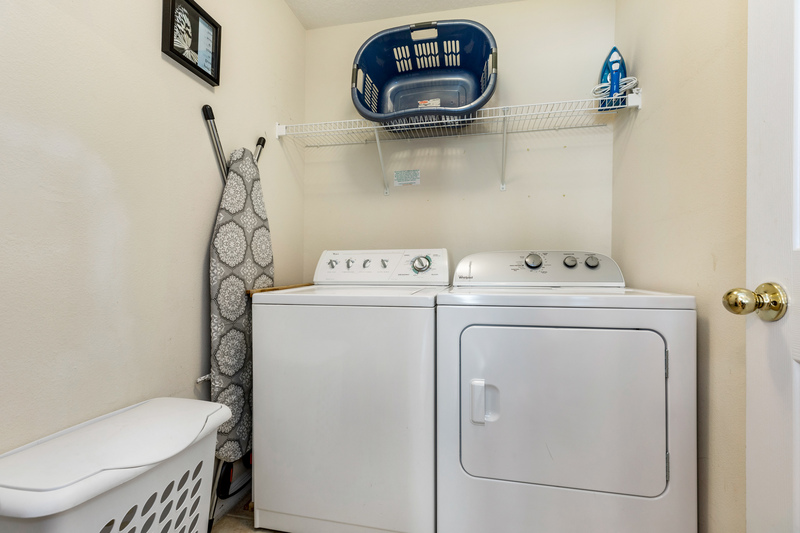 The laundry room has a washer, dryer, iron, ironing board and a vacuum cleaner. There is a games room which has a full sized pool table, air hockey and table football. There is also a X Box One S connected to a 50 inch flat screen' television to keep the kids occupied, with a huge selection of games provided. We haven't forgot about our baby guests! There is a portable cot, high chair, and stair gate. The owners of the villa have tried to incorporate everything to make this villa as luxurious and comfortable as possible, with many extra facilities included to keep their guests entertained including free international calls and WIFI! We found the property to be the perfect size for our 4 adult and 2 children group. The kids enjoyed playing in the pool and the extra pool toys (dolphin, ball's etc.) were a nice touch. The property was as advertised and the check in/checkout process was easy and efficient. Thanks, very good house. Would love to rent again. Thanks, very good house. Would love to rent again. Very professional all round ! Pretty much as advertised. I did have to run out and get some basic supplies that i was surprised were not made available. Garbage bags, Toilet paper paper towels etc....Property Management should be on top of this I think. I did my part to enhance the unit by buying some balls for the foosball table :) Overall I would recommend and use this again in the future. The description of the property as stated on the brochure was accurate. 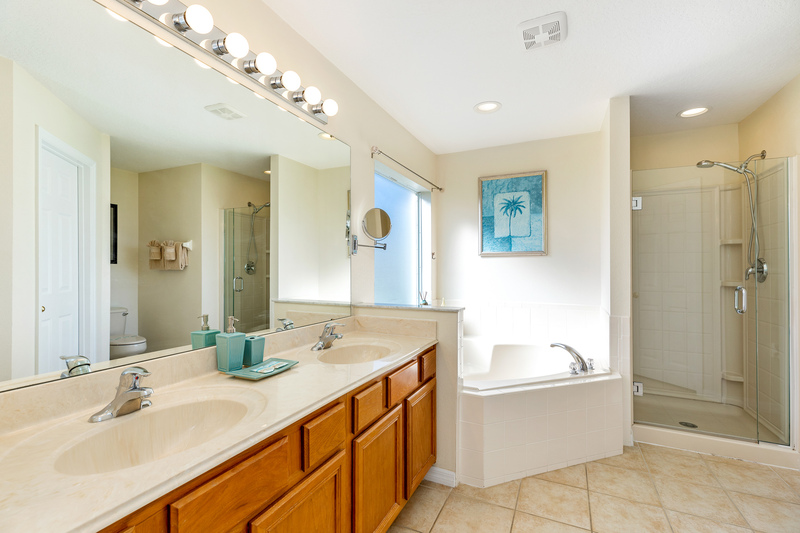 The house is in a beautifully maintained gated community and was clean and tidy. We had problems with the air conditioning and the front door lock and the management company was very quick to respond and assist. The house was extremely well equipped, had tea and coffee and other basics in the cupboard (though we obviously bought our own) and a desk top computer which was useful. The only two small points that we would say are that, the sofas had not been vacuumed under the cushions and the swimming pool cover needed replacing. We would definitely recommend this property and company. great location and community and a generaly a good house ! 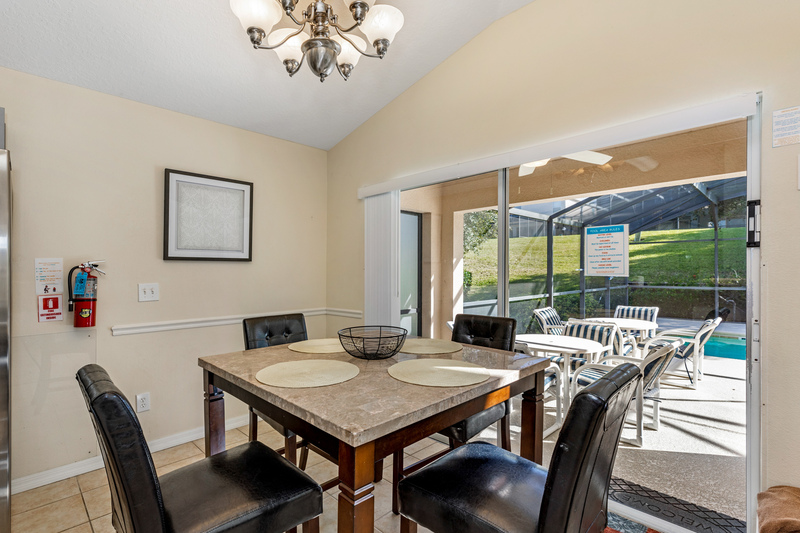 had a great time good size family home in a superb location for fun parks restaurants and amenities. could do with a touch of paint here and there but all in all was not disappointed. We stayed at the villa on the 12th August for 10 nights and were very impressed with it. The Villa was big enough for our party (4 adults and 4 small children). 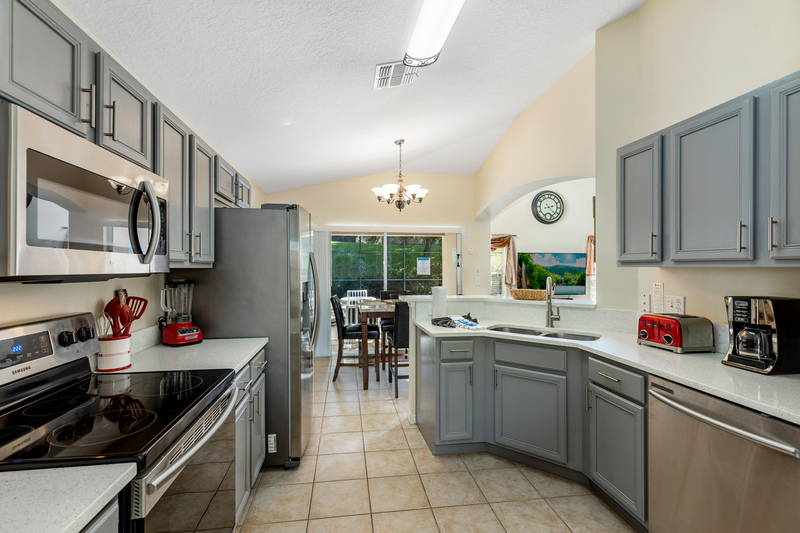 The kitchen was very well supplied with equipment, there were strollers and car seats that you could you if you wish and the Villa was generally in a good standard. It was really good for reaching all the Disney parks and a very easy drive to them. Villa was absolutely fantastic. Had everything we needed and I couldn't fault it. The kids enjoyed the games room and wii, and the pool was so warm it was like getting into a bath! Clean, tidy and exactly as the pictures showed on your website. 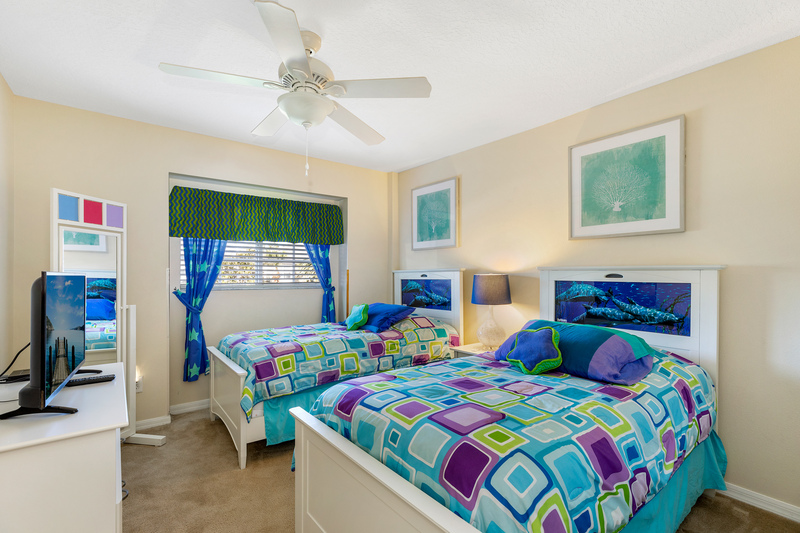 Beds comfortable and rooms very spacious. We had a fantastic week and would definitely return. Many thanks.